The Cathédrale Notre-Dame de Strasbourg is gorgeous, with its red sandstone and tall spire. After traveling in France for a while, you've seen a lot of cathedrals. They are wonderful amazing buildings, such as Notre-Dame de Paris, the Cathédrale de Reims, or the Cathédrale Notre-Dame in Rouen, often painted by Monet. 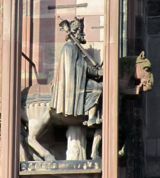 But the Strasbourg Cathedral stands out, for its unique and delicate structure and its distinctive red sandstone. With its soaring spire, it was the tallest building in the world from 1647 to 1874. The building is covered in exquisite carvings and statues. The central door depicts the passion of Christ, while the left (north) door shows virtues overcoming vices, and the right door presents the "wise virgins" and the "foolish virgins." Over the years some of these have been replaced, and the originals can be seen at the nearby Musée de l'Oeuvre Notre-Dame. Higher up, various kings are shown on horseback, and they seem to be riding right out of their perches. There are several pairs of these, visible from different angles. The cathedral is also known for its lovely stained glass windows, many of which date from the 13th and 14th centuries. The Great Organ, a so-called "swallow's nest" construction, overlooks the nave. The cathedral has a single spire, but it makes up for this by the tremendous height and grace of the tower: 132 meters (433 feet) high, plus the 10 meter (33 foot) point. The spire is visible for miles around and is a symbol of the city of Strasbourg. The cathedral was built over a period of four centuries, from 1015 to 1439. It is considered an excellent example of late Gothic architecture. The parvis, or area in front of the cathedral, is the heart of Strasbourg. During the daytime it is packed with people, both locals and tourists who have come to admire this beautiful building. A number of restaurants, hotels, and shops can be found on the Place de la Cathédrale and the nearby Rue du Maroquin. In good weather, street musicians join in to make it even more lively. 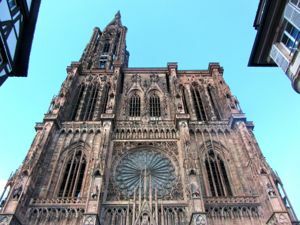 The Cathédrale Notre-Dame de Strasbourg is a jewel that should not be missed. We found ourselves drawn back to it each day we were in Strasbourg, always finding something else to discover and admire. Above, The soaring Cathédrale Notre-Dame de Strasbourg. 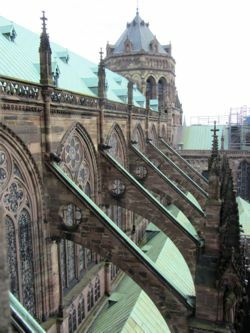 Below, Flying buttresses, seen from above. 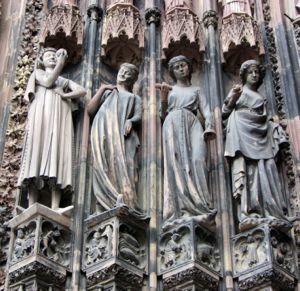 Above, "Foolish Virgins" on right Cathedral Door.